Although a very common Asian desert, most consumers are unaware that Grass Jellies are made from a plant called “Mesona Chinensis”. Maintaining traditional methods, Refresh Grass Jelly Drink is made through boiling carefully selected Mesona Chinensis to extract delicious flavours we are all accustomed to. Once the drink is produced, the Jellies are added to create extra texture for the beverage. 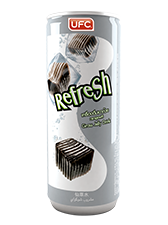 Using natural ingredients, Refresh Grass Jelly is not only refreshing but also filled nutrition.